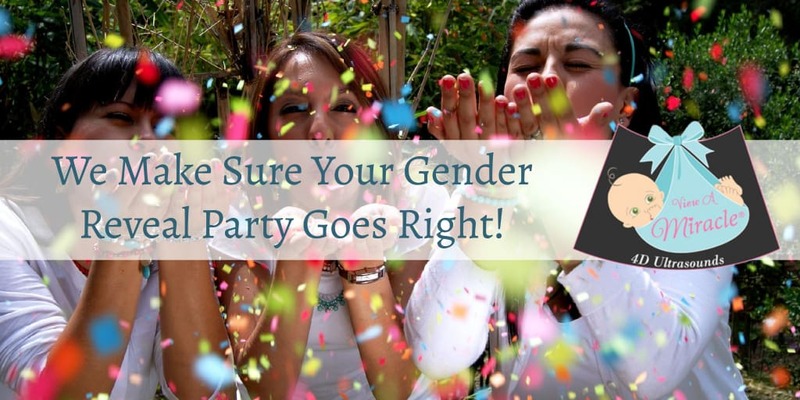 We Make Sure Your Gender Reveal Party Goes Right! Numerous videos showing a gender reveal party going wrong are trending right now. While some are humorous, there are others that show disappointment on the faces of the parents-to-be and their guests. View A Miracle can help you plan the perfect gender reveal party that will be memorable for all the right reasons! We have an on-site gender reveal party which includes gender ultrasound and gender determination. This affordably priced option includes everything you need to conduct a successful gender reveal party such as party space, CDs/DVDs and even a stuffed animal with your baby’s heartbeat. We perform the gender ultrasound / gender determination then provide you with a gender reveal item of your choice to conduct a memorable celebration with up to 30 of your friends and family. We also have a “Peek a Boo, Pink-or-Blue” general reveal package which includes gender ultrasound and gender determination and offers you the opportunity to share your big news in creative ways. We can prepare a pink or blue powder soccer ball, baseball, football, golf ball or soft ball, piñatas, smoke bombs, flutter fetti stick, confetti cannon or decorative balloons for you to conduct a gender reveal party with your family and friends. We are often asked when the best time is to perform gender ultrasound and gender determination. Our gender ultrasound sonographers can perform gender determination as early as 12 weeks with 95% – 99% accuracy. After 16 weeks, we can make gender determination with 100% accuracy. So, what are you waiting for? If you are pregnant and considering a gender reveal party, contact us today so we can place you on our schedule to make your gender determination celebration extra special! https://viewamiracle.com/wp-content/uploads/2018/05/Gender-Reveal-Party.jpg 512 1024 View A Miracle /wp-content/uploads/2019/01/VAM-header_compressed.jpg View A Miracle2018-05-22 14:02:142018-05-22 14:22:56We Make Sure Your Gender Reveal Party Goes Right!